Hello Friends! 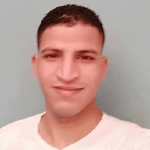 hope all of you are fine.My name is Ahmed and I am a native speaker of Arabic language.I am an online teacher with 1 year of experience and I have a diploma in education. I am here to help you learn Arabic so welcome to everybody.I have taught before online with good ways and I have taught before Holy Quran to children online. If you want to study from materials,I am ready to help you. I will try to make it easy to learn. I can train you to make conversations and improve your listening and your speaking. Good luck and I am waiting for your first lesson. I like this way to learn a language.